Moons and Junes and Ferris wheels, the dizzy dancing way you feel and so on and so forth. We are not here speaking of thecumulonimbus aggregations of water molecules that are such a feature of Scottish skies but rather the images used to display key terms on a site (or indeed any other collections of words). We like them because navigation is the key challenge online – and it’s mostly not a challenge that is satisfactorily met by IT taxonomies or rigid hierarchies of data. Clouds tend to reflect how humans or content behave – either by showing the most popular pieces of content or the most numerous or the most searched for. They present the results in a user-friendly attractive way. Your browser may not support display of this image.All of which means we’re thrilled to have discovered Wordle . It allows you to create your own clouds, based on text you enter or its search of key terms on a website of your choosing. You can then play around with how the words are displayed: horizontal, jangled up, black and white, coloured. It’s a great way of getting to grips with what clouds are.Your browser may not support display of this image. Content Marketing Watch is the latest feature section to be added to our interviews and opinion pieces. 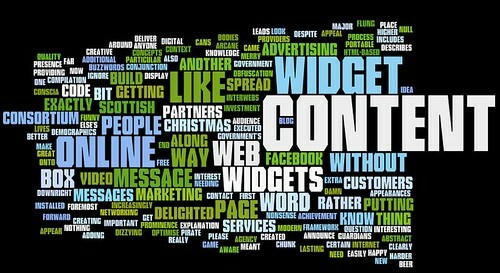 For those of you in the industry who are looking to maximise the most value from the content on your site each week we will have a piece on the latest industry news; covering areas of content marketing such as analytics, internet marketing, content optimisation, search engine marketing and digital communications. Google has created a few videos in its YouTube channel to help explain these changes in more detail. We particluarly like the video on the new motion charts. Is online market research worth the bother? Before the online age, advertisers placed great store on customer demographics, opinions and attitudes, behavior, geography, media consumption and the like. Advertising agencies created advertising campaigns to target particular audience groups for their clients – often with considerable success. Now we have online marketing, content marketing, digital marketing and mobile marketing. But it would seem that advertisers know less about their online audience than they do of their offline audience. It is not uncommon for example for media buying agencies to place online ads in Print Media newspaper websites based on the offline audience readership metrics – the assumption being that the online and offline audience must be similar. Well, what do you know; it looks like it pays to research your online audience. It turns out The Telegraph and Guardian Unlimited websites do indeed attract the same readers online and offline, however The Sun, The Times and the Daily Mail attract a much broader online audience. Heather Hopkins of Hitwise brought this to our attention in 2007 – yes, I know, it’s old news, but I rediscovered it yesterday whilst I was doing some research for one of our clients. We often talk about the value of providing access to your archive of “old news”, its one of the principles of content marketing, if it’s online someone will find it and find it useful. If you are interested in researching you audience you may end up using the services of companies such as Hitwise, Nielsen Online comScore and quantcast. If you have a significant audience based in the United States, you might be interested in checking out the audience profile for your site on quantcast. Also you might want to have a look at their new service the media planner allowing advertisers to target audience by age, gender, income, ethnicity and education. The service is free and is focused on US Internet audiences, however ‘Quantified Publishers’ can get access to breakdowns of their audience from around the world. Now, getting back to researching the audience for that social marketing campaign, what is the difference between the US and UK population browsing habits for a particular demographic? I was tempted to assume there would be significant similarities but what do you know…..
We are uncovering w00tonomy’s take on the se7en deadly sins and the virtues of Content Marketing. These are the vices we’ve seen drag businesses into the express elevator to redesign hell. Going down! The last sin in our series happens when all that excitement over your site launch is a distant memory and you start to hear the murmurings of another site redesign. The lack of post launch editorial planning has started to destroy that great design that you agonised over. As the content has been lumped onto the site the usability has been lost and customers complain that they can’t find the information they need. The analytics which were a key part of your business case to support the site development budget have become just another spreadsheet of numbers that are reported each month – no follow-up action and no progress. And a recent customer survey that you ran online your customers say that they find your competitor’s site better and easier to use. This is when the defensive rage starts to kick-in. The problem is not yours, it’s the customers. They don’t really understand your business; there are very few people interested in your content and it is very dry and uninspiring so it is not surprising nobody wants to read it. And finally your customers don’t really like to use net anyway. Over the years we at w00tonomy have heard all of these. If any of these are true then you should probably question why you built a site in the first place. The reality is that away from the jargon and Internet speak, carrying out your business online is no different from any other aspect of what you do – it has to be audience focused. People want things that add value to their lives. People like stories and dislike advertising. People like to build trust through relationships over time. People like to learn through interaction. People like to be in control and not be interrupted. What makes online so different is that it condenses all of these experiences onto a single screen. This why we at w00tonomy are driven by the belief that “every business has story to tell each one of its customers” and why it is the most effective and only way to build long-term relationships online. What does that actually tell us? The answer is very little – it gives no real nderstanding of who is visiting a site and what they are doing. The reason so many businesses accept this quality of reporting (and so many agencies provide it to clients) is simple. With the sophistication of analytics software now available in the market place (Google Analytics, HBX, Omniture, etc) production of data is cheap but intelligence is expensive. For this reason businesses and agencies are often greedy for data and do not invest the time and effort to turn data into intelligence. Without this investment they try to substitute volumes of data for insight – the intelligence must be in there somewhere so no-one can complain they never saw it. Data will not help when you evolve your online strategy. Instead any changes you make will be a gamble that will be based on a hunch or the HIPPO effect (HIghest Paid Person’s Opinion) described by Avinash Kaushik. In order for the cycle of measure and evolve to work effectively your digital marketing strategy should be driven not by the greed for more data but by intelligent analysis making clear recommendations. In. Plain. English.